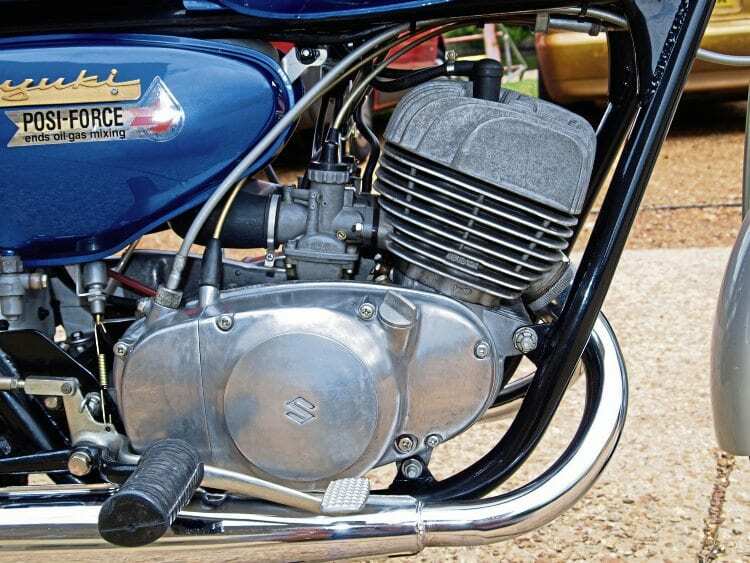 Steve Cooper appraises a significant two-stroke twin from Suzuki’s Hamamatsu factory that lifted customers’ expectations in the sub 250cc category onto a completely different plane. Despite the downsized engine, the T200 lost little in performance to its larger-capacity stablemate, the T20. Anyone who’s familiar with the earlier Japanese motorcycles will know just how significant the Suzuki T20 was. In one package, here was the bike that pretty much cemented the blueprint of Japanese two-stroke twins for the thick end of three decades. Others eventually got there too, but it was Suzuki that arrived at the finishing post first. With six gears, a half-competent chassis, decent brakes and a peachy motor, this was how two-strokes should be. Buoyed with the success of its achievements circa 1965, it was only logical to offer more of the same, and this is exactly what happened. Suzuki swiftly delivered the T500 along with a miniature T20 called the T125, and finally the awesome T200, aka the Invader, aka the X5. Everything the company had learned about two-strokes was condensed into one new bike – and what a piece of kit it proved to be. Suzuki had gleaned a whole lot from the T20 which, despite what its fans might say, was always something of a ‘work-in-progress’ machine – in fact, Suzuki would continue to update and modify the T20 throughout its production life. One of the key differences was the chassis of the Invader, which was overtly stiffer than the T20’s. This facilitated better handling by courtesy of improved design and shorter tubes that flexed less. Although only running five ratios as opposed to the six in the T20, the new sub-250 punched well above its weight. At just 120 kilos dry weight, the new machine was a full 23 kilos lighter than its bigger brother, yet with a claimed 23bhp as opposed to the 29bhp boasted by the 250, the Invader had a distinct power-to-weight ratio advantage that showed on the open road, where the new 200 was consistently clocked at 88mph against a claimed 90-plus for the 250.